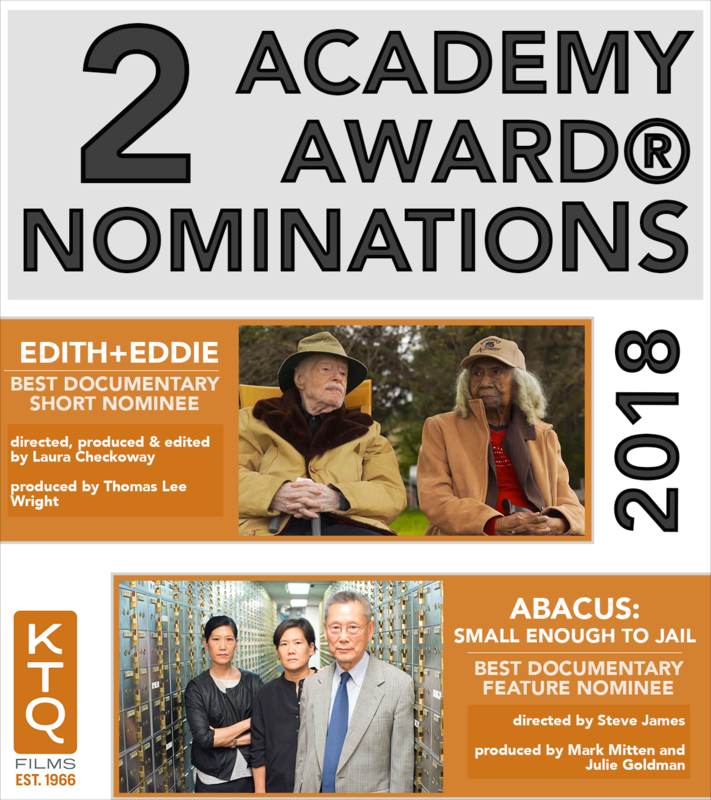 Kartemquin is absolutely thrilled to share that both Edith+Eddie and Abacus: Small Enough to Jail have been nominated for the 90th Academy Awards® in the Feature Documentary and Documentary Short categories, respectively. Edith+Eddie is directed, produced and edited by Laura Checkoway; produced by Thomas Lee Wright; co-produced and edited by P. Corwin Lamm; co-produced by Karina Rotenstein; with cinematography by Neil Barrett and John Larson. The film is executive produced by Cher, Steve James, Gordon Quinn and Betsy Steinberg. Abacus, presented by PBS Distribution, Frontline and ITVS, is produced by Mitten Media, Motto Pictures and Kartemquin Films; edited by John Farbrother and David E. Simpson; music by Joshua Abrams; cinematography by Tom Bergmann; co-produced by Fenell Doremus, Nick Verbitsky and executive produced by Gordon Quinn, Christopher Clements, Betsy Steinberg, Justine Nagan, Raney Aronson, Sally Jo Fifer; produced by Mark Mitten, Julie Goldman and directed by Steve James. In December, Edith+Eddie earned the Best Short Award at the 33rd Annual IDA Documentary Awards in Los Angeles. Edith+Eddie has had an outstanding festival run, earning Best Short Documentary at the Hamptons International Film Festival, Best Documentary Short at the Palm Springs International Film Festival, Best Documentary Short at the Nevada City Film Festival, Outstanding Documentary Short Film at the Tallgrass International Film Festival, the Flicker's Youth Film Jury Award for Best Documentary at the Rhode Island International Film Festival and an honorable mention for the Short Doc Award at the 2017 Sheffield Doc Fest. The film was also nominated for the Cinema Eye Honors' Outstanding Achievement in Nonfiction Short Filmmaking Award. Abacus earned three nominations for the Critics' Choice Documentary Awards, winning in the Best Political Documentary category. The film was also nominated for Best Documentary by the National Board of Review and Best Documentary by the Chicago Film Critics Association. The film won the Audience Award at the San Diego Film Festival Showcase, Audience Award: Best Documentary at the Sarasota Film Festival, Best Editing: Feature Length Documentary at the Ashland Independent Film Festival, and Runner Up - Grolsch People's Choice Documentary Award at the Toronto International Film Festival. Follow Edith+Eddie on Twitter and Facebook. Visit the film's official website at editheddie.com. Follow Abacus: Small Enough to Jail on Twitter and Facebook.